A new version of the successful SurvitecZodiac MIS MES escape slide and liferaft system has been fitted to the latest addition to the Ventrafiken fleet. 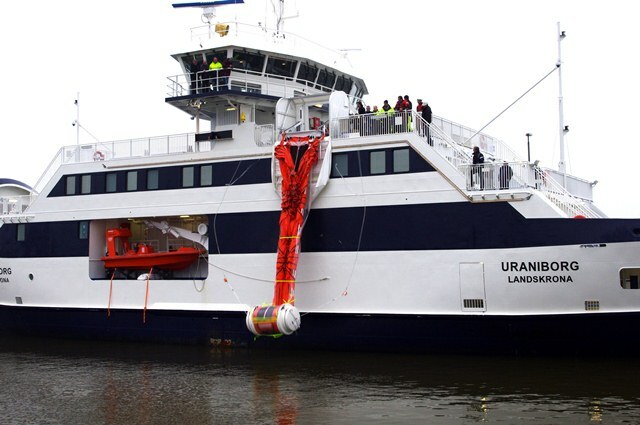 The Uraniborg was recently completed at the Hvide Sande shipyard in Denmark and has just entered service between Landskrona and the island of Ven located in the Oresund between Sweden and Denmark. 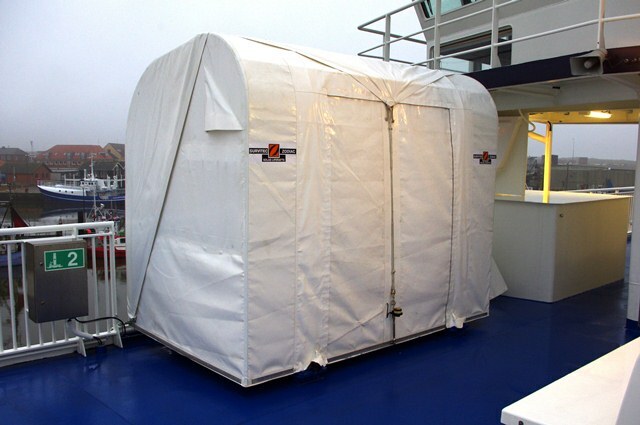 The SurvitecZodiac liferafts are stored inside the rolled and folded inflatable slide and, carried aboard a tilting deployment cradle that, with previous systems, would be housed within a GRP or shell door containment. When the new weight saving fabric cover is used the system can be stored anywhere damage by machinery or deck activity is less likely. All liferafts used by the new system are of the SurvitecZodiac Aspirator type which makes it possible to reduce the overall weight of the system by having a lower requirement for bottled gas for inflation. A regular Throw-Over Self Righting 150 person raft weighs 840 kg whereas a SurvitecZodiac Solas Aspirator Throw-Over 150 person liferaft weighs just 490 kg which makes it particularly suitable for use on high speed craft. 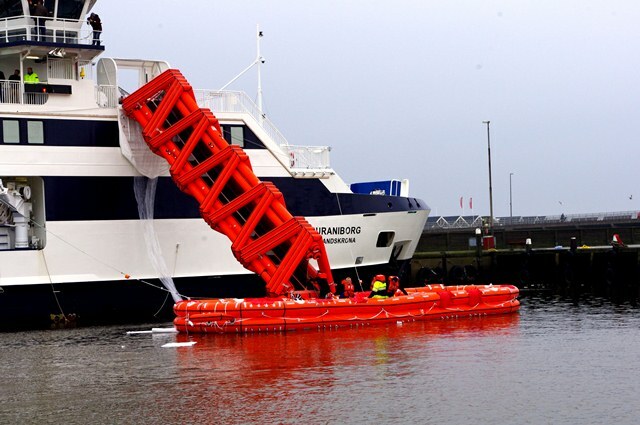 Before the Uraniborg entered service, the escape slide system was subjected to a full scale trial in the harbour at Hvide Sande. The 14.5-metre double slide was launched from a height of 9.3-metres and the first raft was automatically deployed. 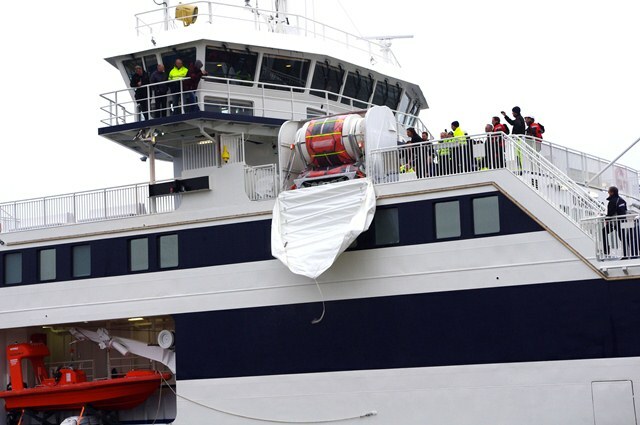 The pre-connected second raft was then launched from the first to create capacity for over 300 passengers and crew. When used in a genuine emergency and the ship evacuation is complete, the last crew member to disembark can activate a pyrotechnic knife patented by SurvitecZodiac. This device allows 30 seconds of escape time before it separates the slide from the ship. 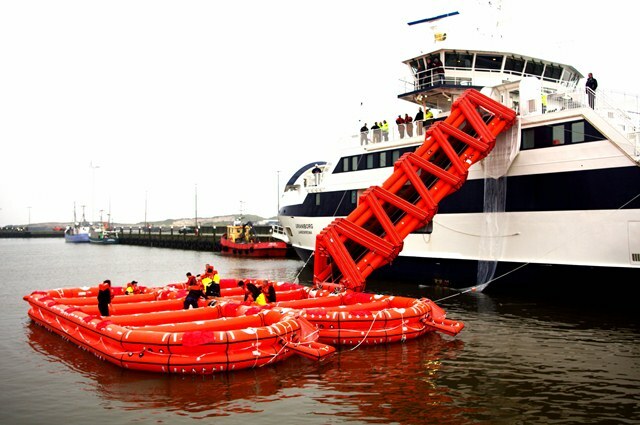 The slide design is known to provide the fastest evacuation speed for small to medium-sized ships and high speed craft as it can enable the escape of 731 passengers in 30 minutes when used with SurvitecZodiac’s Throw-Over 150 person canopy liferafts. The SurvitecZodiac MIS MES evacuation system is deployed at right angles to the ship’s side and is available in four sizes covering freeboard installations from 3.8 to 9.3 metres. The brand is also now preparing a 12.5-metre version for approval in early in 2013. The slides are designed for deployment at an angle of 30-35 degrees as specified by SOLAS rules and are suitable for a wide range of vessels. The SurvitecZodiac SOLAS MES MIS may be supplied for new builds such as the Uraniborg or for retro-fitting. It can be provided with a choice of Throw-Over 100 or 150 person (B Pack) and Throw-Over Self Righting 100 or 150 persons (B Pack), Open Reversible Inflatable 100 or 151 person (HSC Pack) as chosen for the Uraniborg.